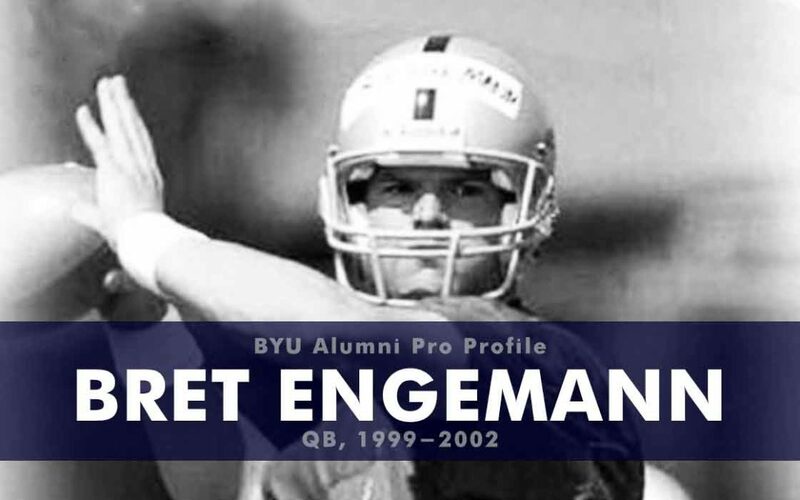 At BYU Engemann played in six games as a freshman (1999) including going 6-of-11 for 45 yards in the Motor City Bowl. As a sophomore (2000) he had 447 yards passing with 34 completions against Virginia, both stats rank no. 2 all-time in the MWC single-game record book. His season was shortenend with a knee sprain and then a shoulder injury. He redshirted in 2001 and in 2002 he played in eight games and completed 119-of-215 passes for 1,334 yards and six touchdowns. For his collegiate career he completed 200-of-364 passes for 2,288 yards and nine touchdowns. Engemann went undrafted in the 2003 NFL draft but signed a free agent contract with the Oakland Raiders. He split time between the Raiders practice squad and teams in NFL Europe from 2003-2005. In 2011 he played for one year with the Utah Blaze of the Arena League. Since his playing career ended Engemann has worked in real estate and he is now an executive for MXI Corp.